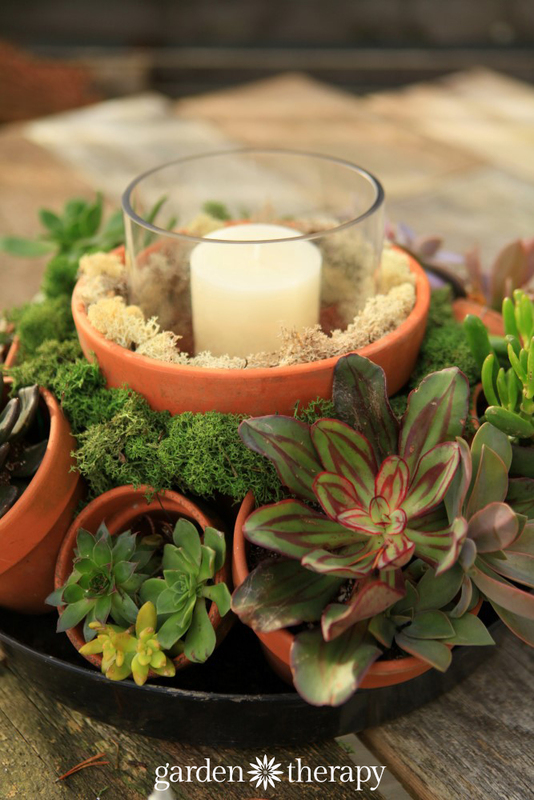 It’s hard to believe that this gorgeous succulent centerpiece was made from the humblest of materials. An inexpensive wire hanging basket frame, terracotta pots, reindeer moss, and a hurricane candle make for a show-stopping planter / table decoration that will get people talking! 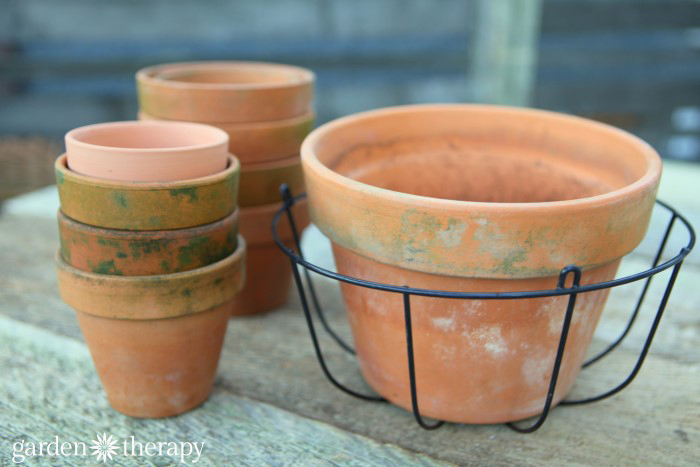 Who else out there has too many terracotta pots? Well, really, how many is too many? 50? 100? 500? 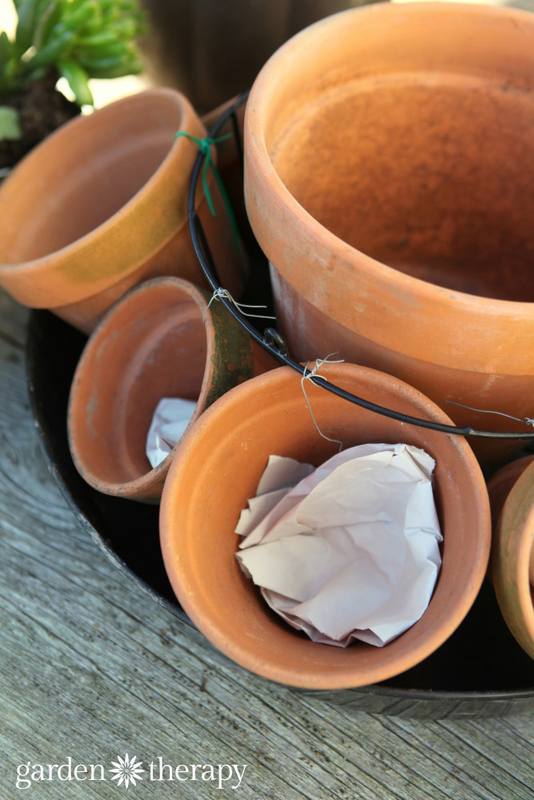 Admittedly, I have probably close to 100 terracotta pots around the garden filled with plants or stored for a sunny-day gardening project. 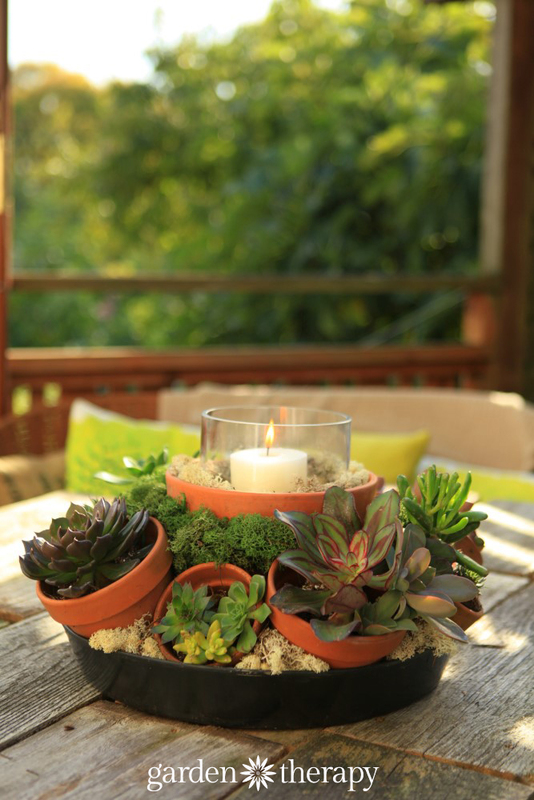 It’s hard to beat a sunny-day gardening project like this succulent centerpiece! 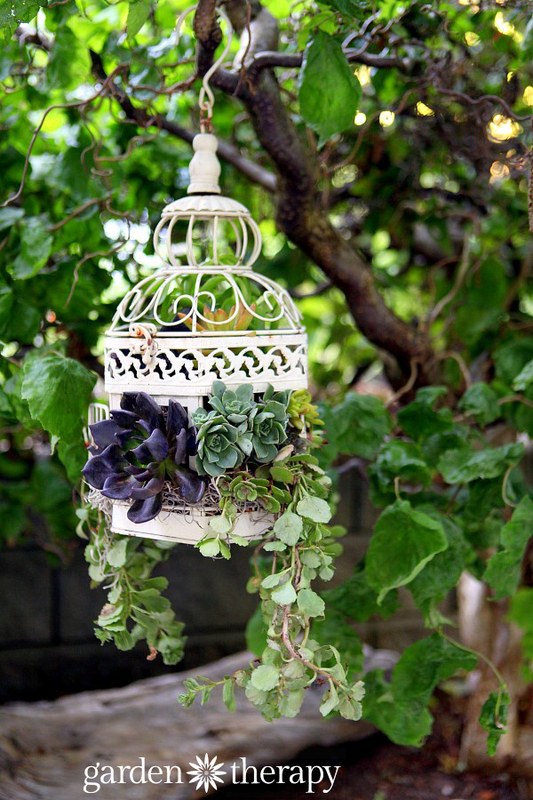 It was pulled together with unused materials that were hanging around the garden shed. 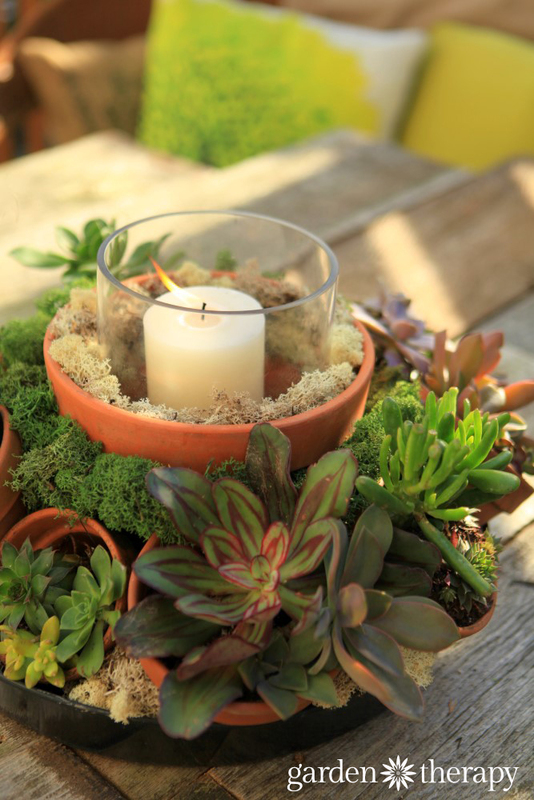 As I puttered around one day in the shed, the idea bulb lit above my head and this succulent centerpiece was born! 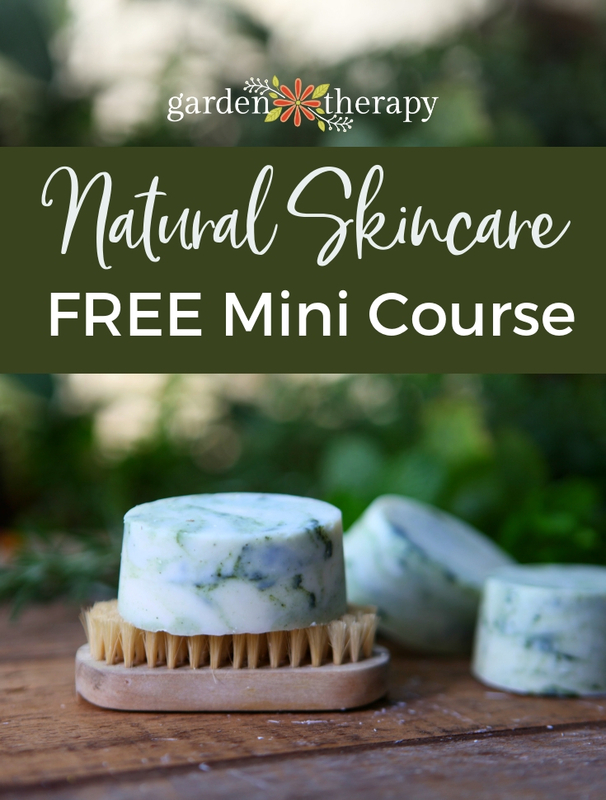 Start by sussing out your materials. 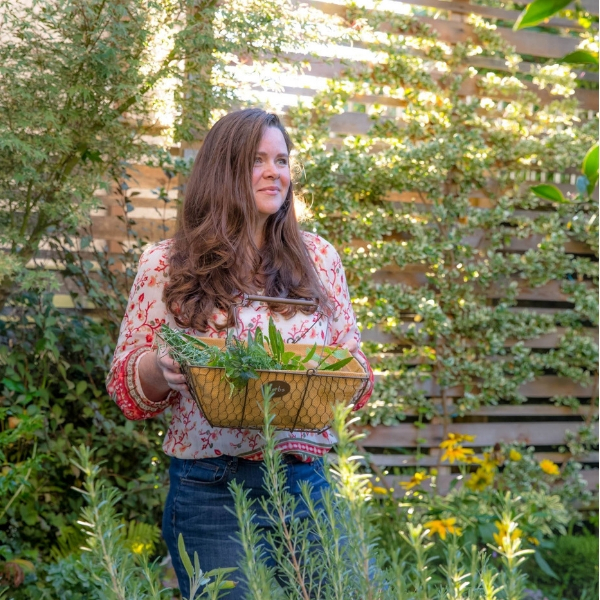 You want to look around the garden shed or the garden center for a wire basket that’s not too large as you’re finished centerpiece will be almost double the diameter of the wire basket. Unless your table is enormous you’ll want to look for a small or medium sized wire basket. I bought mine from a dollar store in early summer, to make these fabulous solar fairy lights in my son’s play garden. Next, find some pots that fit the design. 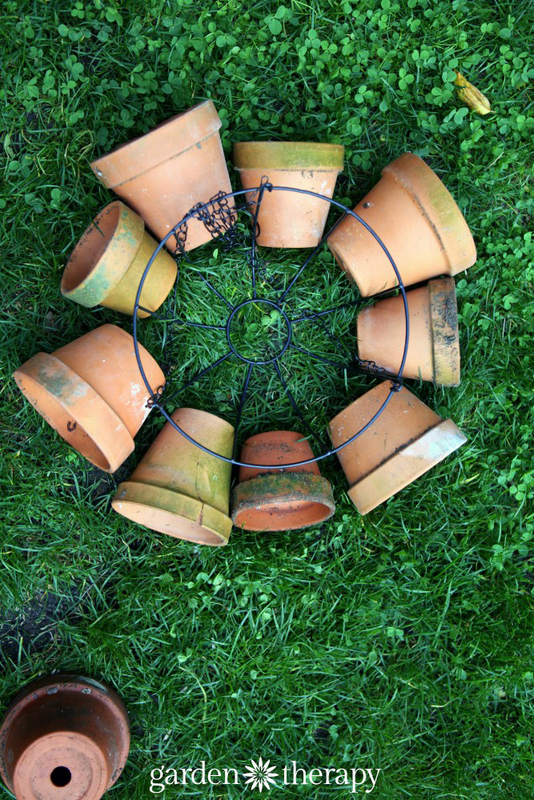 Look for a medium sized but stubby pot for the center of the basket and various sizes of small or medium pots to go round the outside. 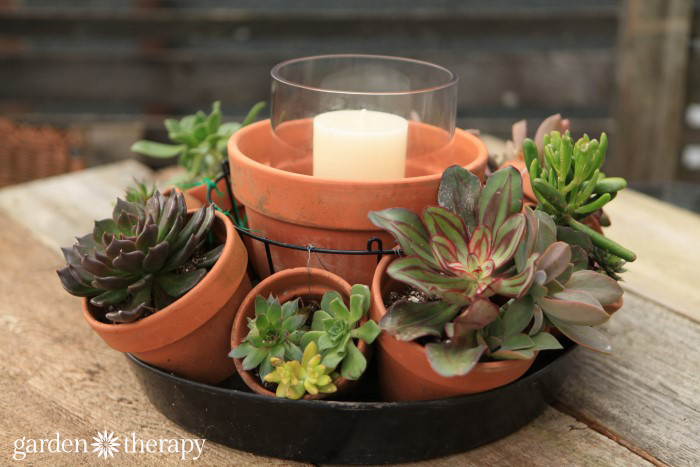 Set the pots out and move them around, readjusting the size and the placement, until you have a cohesive design that works as a centerpiece. 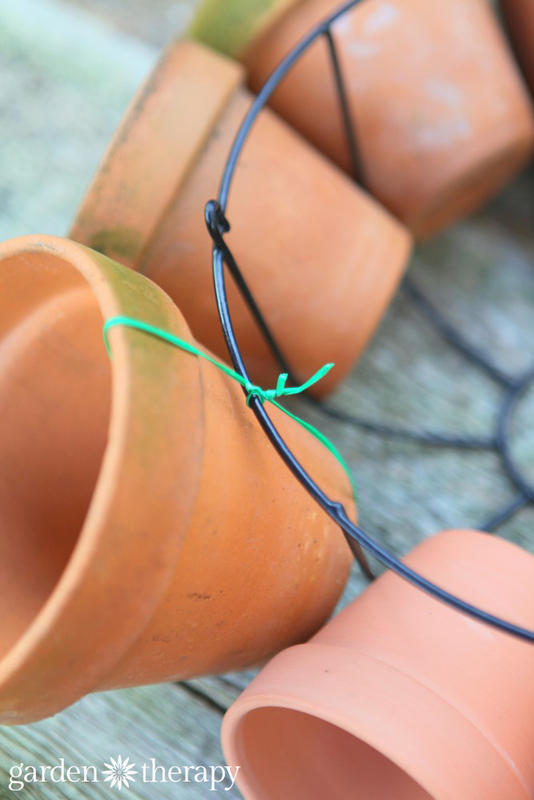 Attach the terracotta pots to the wire basket by using garden wire. String the wire through the hole in the bottom of the pot and loop it around and twist it onto the wire basket. The center pot does not need to be wired. Set the entire structure on a plant tray to catch water and protect your table, but also to keep the design cohesive. I chose to use a plastic plant tray in a dark color so that it fades away but also so that it protects the table. Terracotta is porous and will soak through to the surface below. Line each one of the pots on the perimeter of the centerpiece with a small piece of newsprint or a coffee filter. This will help prevent the soil from seeping out of the drainage hole and messing up your table. 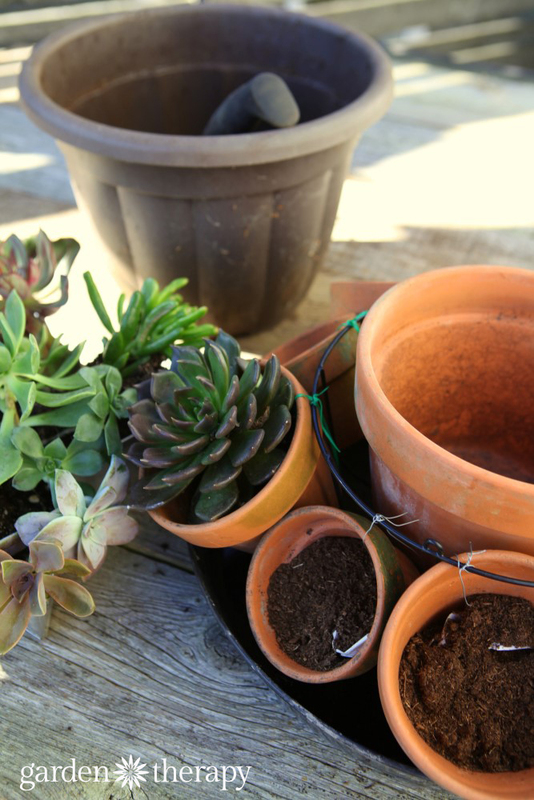 Add some cactus and succulent potting soil into each one of the pots on the perimeter. 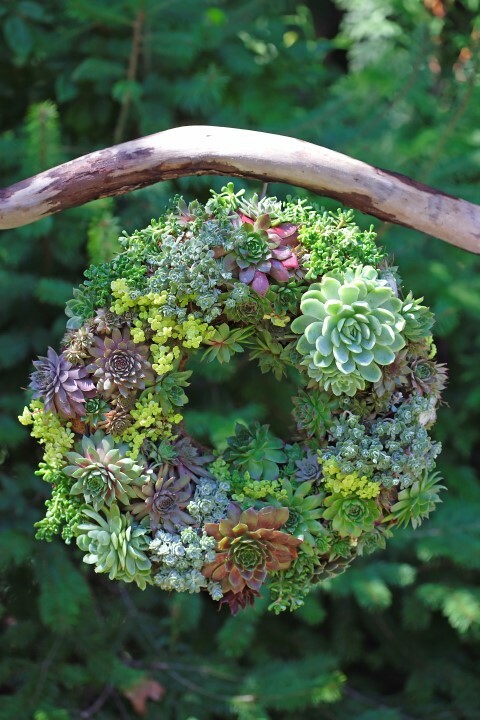 Plant succulents in a variety of shapes, sizes, and colors around the outside. 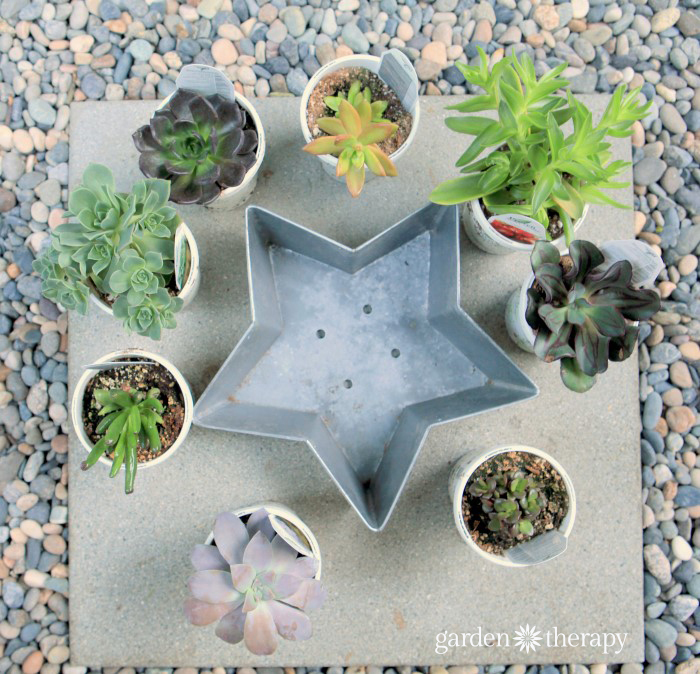 Be sure to combine different types of succulents in some of the larger pots and add different textures, heights, and shapes to create interest. 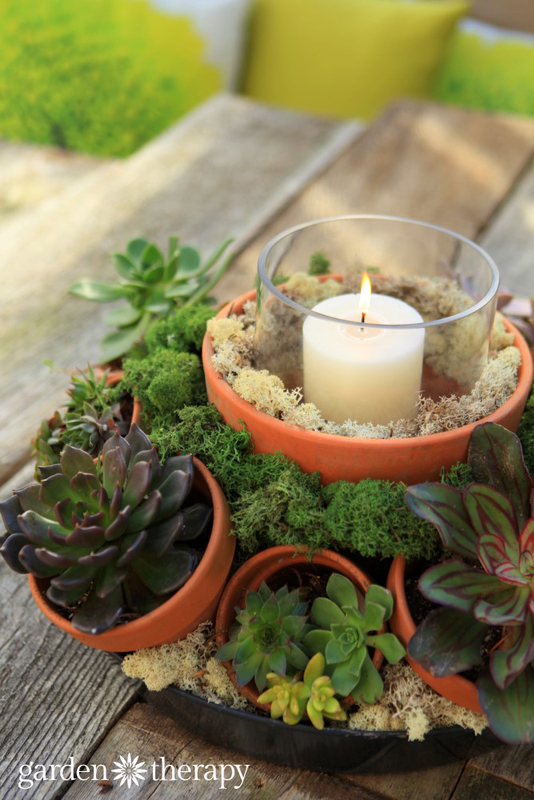 Now add the glass hurricane candle holder into the large pot and set the candle inside. Your centerpiece is almost complete! To hide the wire and give the centerpiece a finished look, tuck reindeer moss in a variety of colors into the spaces in between the pots and around the wire. 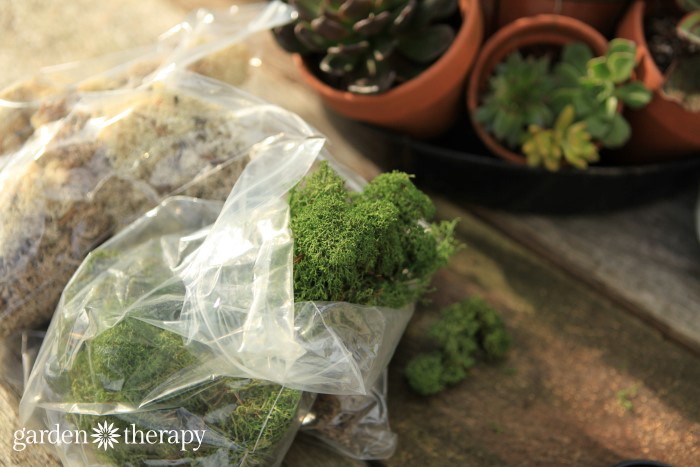 Tip: use a hot glue gun to attach the moss to the wire where it just won’t stick. Your centerpiece is now ready to grace the table. 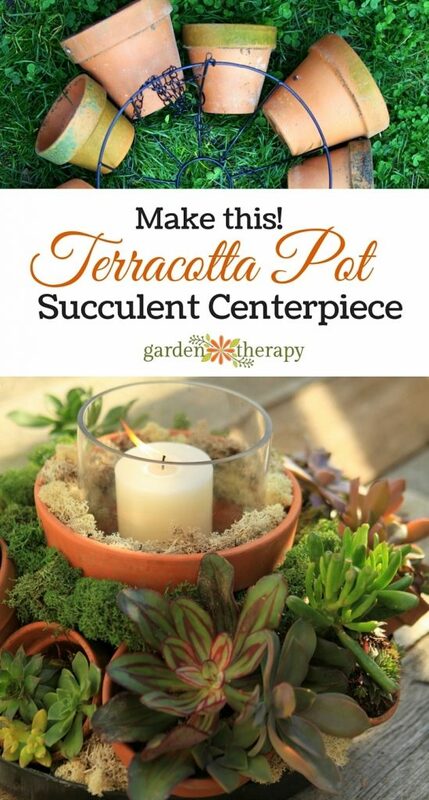 Set on an outdoor table and turn it regularly to ensure that the sun reaches all sides. Water whenever the soil becomes dry and make sure to pour out any overflow water in the tray if necessary. Want More? Yeah you do! !